For the last 6 weeks or so we have been celebrating HARD! I’ve unintentionally / on purpose postponed writing about my scan results because I just haven’t been able to wrap my mind around it. I told you, I take a LONG time to process things! CT scans revealed that the tumors previously found in my chest wall muscles, scapula, breast, neck, scalp, spinal column, and right atrium were completely gone. Tumors in the liver, spleen, heart, and neck had an overall reduction in size of 60%. But the most impressive BY FAR were the results from the echocardiogram. On the left side of this image is a picture of the tumor before pembro/axi treatment from when I started the trial in May. 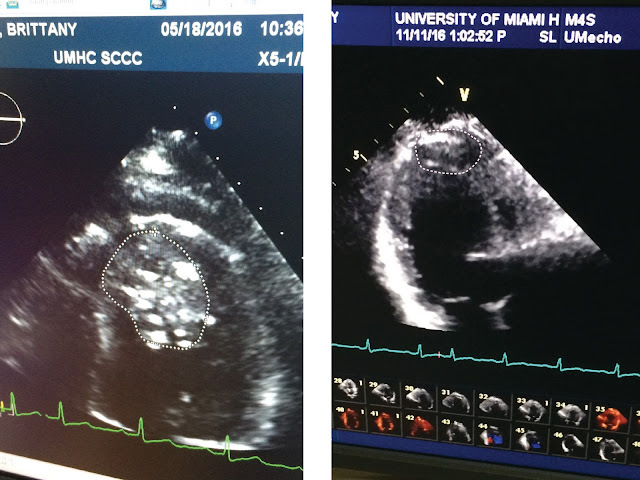 The mass inside the dotted line is the tumor that has been in the left ventricle of my heart for 4 years (white represents normal tissue and tumor, black is heart chamber where the blood is). On the right is a picture from my November 11 scans. It’s about 75% smaller! After only 6 months! This is easily the most dangerous and life-threatening tumor I have, and to see it shrinking away, melting away, is simply miraculous (as said by the echo technician, the radiologist AND my oncologist, all separately). John and I ran our own numbers, and we estimate that the overall tumor burden has been conservatively reduced by about 80%! Miraculous. I totally agree. I am simultaneously stunned and not surprised. We prayed with confidence and faith that God would take care of us, and he did. Even if the tumors had been larger or more widespread, God would still have been taking care of us all along the way. It’s what he does, it’s who he is; he cannot help but mercifully and graciously love us, as sick and messed up as we are. That is tremendously humbling to me. I haven’t been able to post about this before now because I’ve been wrestling in my heart with two words that have never entered my mind before those moments with the scans- why me? When I was diagnosed (several times), I knew why me- for the same reason why it could be any of us! We’re human and broken and in need of saving, set with an expiration date to go home (you know, HOME home- the up there in the clouds home). Now I sit with these remarkable miracle scans in front of me and humbly and tearfully ask The Lord, “Why me? Of all the mothers and brothers and grandchildren and poor and hurting people who receive prayers for healing in your name- why was I spared when others weren't?” After weeks of hiding this little question in my heart,, I found that I already knew why I was spared- for the same reason why it could be any of us that are spared! Because he’s got more for me to do here. With you. Bringing glory to his name. This is tremendously humbling to me. If you know me well, you know that I am not a humble person. At all. It’s not my gift. And yet looking at these scans, seeing the fingerprints of God left behind in this masterpiece miracle, I find my self-righteous and arrogant persona quickly melting to the floor. How can I look at this and think anything except “God, you are amazing.” How can I ever again think that my place in life is because of my smarts or abilities or charm? No, I am living and breathing right now because of the mercy and graciousness of Jesus Christ. And you know what?! I was only living and breathing BEFORE the cancer because of the mercy and graciousness of Jesus Christ, but was blind to see that truth through my veil of arrogance. It’s the same for you. Whatever your redemption story- TELL IT. Don’t have one? Use mine. 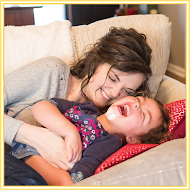 Mom-of-toddler being successfully treated for metastatic (stage IV) cancer she’s had intermittently since she was 2; she lived long enough to finally receive the treatment she’s needed for 25 years. Wife of minister finding humility after a lifetime of arrogance and perfectionism. Young family finding life in Christ more than life in healing. Use mine. Before I sign off, I want to implore you: If you know anyone who has late stage sarcoma, especially ASPS, please tell them about these findings and this trial. It’s a rare disease with very few research opportunities, so please help me spread that word! Follow this link to the trial via clinicaltrials.gov (a great site for ANYONE who is looking for a clinical trial of any kind!). We shared this information with our church one Sunday. If you want to see it, you can follow this link and click on "God So Loved The World," we start at 5:30.